I think Adobe Analytics is well suited for small or large businesses with the brain power to understand how the platform works and then use it to its full extent. It is a powerful platform that can become costly. I would not recommend AA to people who are beginners or have a limited budget for analytics. Kissmetrics is a very good and simple tracking and reporting system. I think that all web properties should have it installed in order to be able to track what's important. You can still have google analytics in conjunction with KISSmetrics and get good insights from that product, but the simplicity and ease-of-use offered by Kissmetrics makes it a no-brainer. Can combine various digital platforms in just one view. The speed with which it pulls historical data. Very appealing visuals and switching between trended view and ranked view. Kissmetrics has a fantastic dashboard where you can see all relevant metrics immediately after login. Kissmetrics was extremely easy to implement in our site and it works across different platforms. After the initial setup, managing and creating new events to track is super simple. You can monitor live usage. This feature allows you to monitor user interactions as they are happening and as events you are tracking are triggered. You can see exactly what users are doing real time, which is really a very cool feature. At the time, this kind of realtime monitoring was not possible with Google Analytics. No proper governance on all the dashboards, users creates dozens of dashboards and leave it on the server with 100s of versions. Overall implementation is cumbersome and time-consuming. Need proper tagging on all of your platforms as well as all hits and instances. Live usage UI can be improved a lot. although this was definitely a very cool feature, it was somewhat marred by a poor and confusing UI. It shows a stream of actions events being triggered, but it's a bit difficult to figure out how to actually use this stream of data. For example, it;s very difficult to follow a single user. This feature needs a much more intuitive visual design for it to be truly useful as well as just cool. The user interface and business facing side is incredibly powerful and useful, the back end can be a pain point for many. 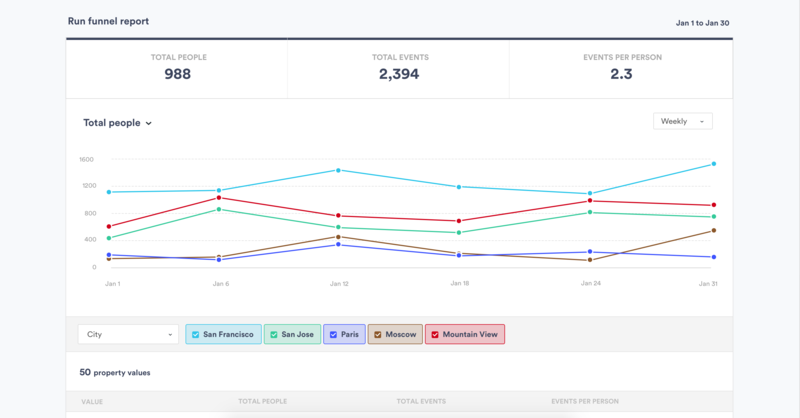 Right after login, you'll get to a dashboard which shows you a quick view on how your business is doing across the events you are tracking. There is no need to dig deeper than that unless you want to, in which case it's very easy to do so just by clicking on the metric on which you want more information. The interface is very intuitive. In a year, we had trouble logging-in just once. But even then all tracking data was later available once the site came back up. also, the system down notices were very informative - they explained the reason for the downtime and were constantly updated with progress in getting the problem resolved. For the most part, Adobe SiteCatalyst reports work ok, but there are cases in which reports take a long time to return. These cases are usually when too much data has been stored in Conversion Variables (eVars). Speed improved dramatically as the service matured. Early iterations of the publicly-released application would occasionally provide slow processing of results, but those delays became much rarer occurrences during the last year that we used KISSmetrics. One of the more impressive views (which started out feeling more like a toy) is the live view of visits. Knowing that you could see, in real time, what events a user triggered, was gratifying and instructive. Their support is excellent and responsive. Again, we were fortunate to work with KISSmetrics as they built their application, but Hiten, their CEO and founder, was incredibly helpful to me personally, and to our metrics-driven business as a whole, as we adopted their tool. The online documentation is clear, prominent, and up-to-date. I required almost no hand-holding for the adoption of any of their tools as they were released. This is a self-service product, so procurement and billing are extremely simple. The system is also pay-as-you-go, so there are no surprises when, for example, you exceed the number of allowed transactions and the system is inaccessible. until you pay more. Setup was extremely easy and the whole process was hassle-free. Adobe Analytics runs a close 3 with Google Analytics and pales in comparison with Webtrends. I inherited management of Adobe, but if I had my choice I'd switch to Webtrends if not for their ease of SQL customization and their ability to easily create bitstream data without costly add-ons. When you work as an analyst, telling your boss that you need more money for software they've already purchased does not go over well. I could finagle it, but with so many key pieces relying on our web data, it's not worth it. Kissmetrics and Google Analytics both have their strengths and weaknesses, but for individual user and advanced campaign tracking, Kissmetrics wins. As complicated as Kissmetrics can be (depending on how advanced you want to get with it), it's still significantly easier to set up and read reports related to user funnels in Kissmetrics. Google Analytics has built-in demographics and location info, but individual user tracking leaves much to be desired. Just setting up Google Analytics requires a crash course in how to use the service, which isn't ideal for many companies who don't necessarily employ someone solely for their experience using Google Analytics, but rather their entire set of marketing skills.LiveOrange and Mixpanel are two additional competitors, but with my limited experience of them, I'm unable to go into detail about the pros and cons of those services versus Kissmetrics. Ability to see specifics about how PPC campaigns have performed down to the level of keyword etc., tied to seeing which individuals have not only submitted a form but turned into business. Ability to pull better reports on lead performance.